Monday morning of our second week of school dawned stormy and gray, not the best encouragement to get out of bed for little bodies still on their sleepy summertime schedule. 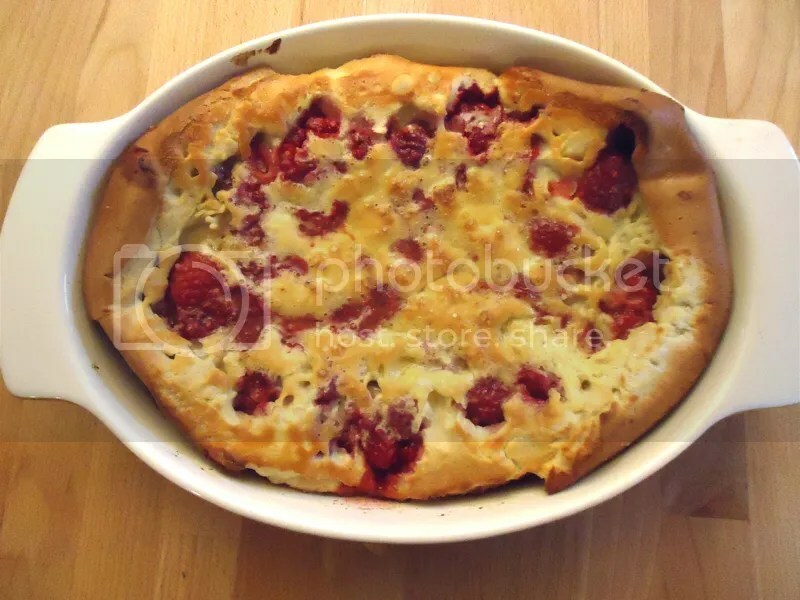 This Raspberry Dutch Baby was the perfect way to brighten up the start of our day. 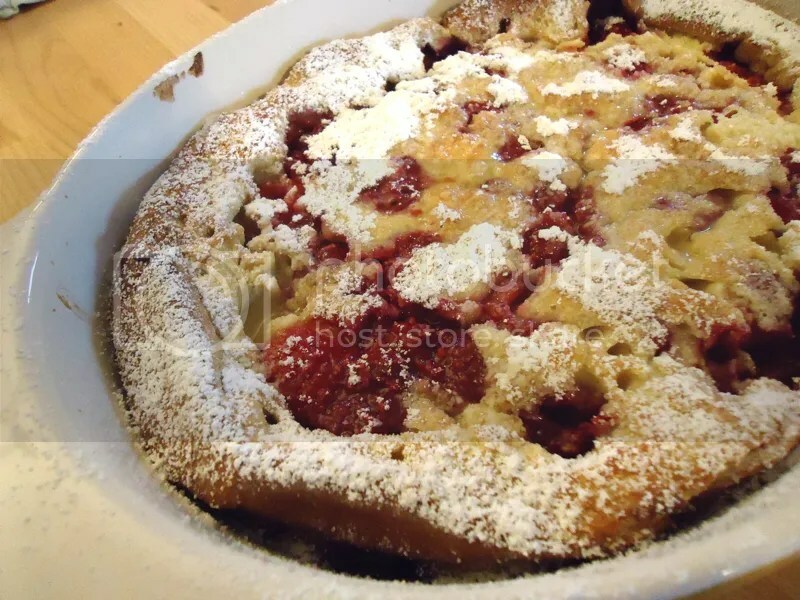 A dutch baby is a cross between a pancake and a popover, eggy and fruity, with a hint of sweetness and cinnamon. It comes together in five minutes, but between the golden brown dome and a sprinkling of powdered sugar, it makes morning feel like a special occasion. Oven 450F. Cut the butter into two pieces and place in small glass or ceramic baking dish. (I use either a 9″x6″ oval or a 9″-round dish.) Place the dish in the preheated oven for the butter to melt while you finish the remaining steps, about five minutes. In a small bowl, mix the raspberries with two tablespoons of the sugar, breaking up a few of the berries so they better release their juices, and set aside. In a blender, mix remaining tablespoon of sugar, eggs, milk, flour, cinnamon, vanilla, and salt. Blend on medium speed for one minute, until thoroughly mixed and a bit frothy. If you would like to use a cup of thinly sliced apples or pears instead of berries, then the directions change slightly. While the butter is melting in the baking dish in the oven, toss the fruit with two tablespoons sugar, an extra 1/4 tsp. of ground cinnamon, and a grating of fresh nutmeg. Arrange the fruit slices evenly in the melted butter and bake for 10-12 minutes, until softened. Prepare the batter as directed above, then pour over the cooked sliced fruit. 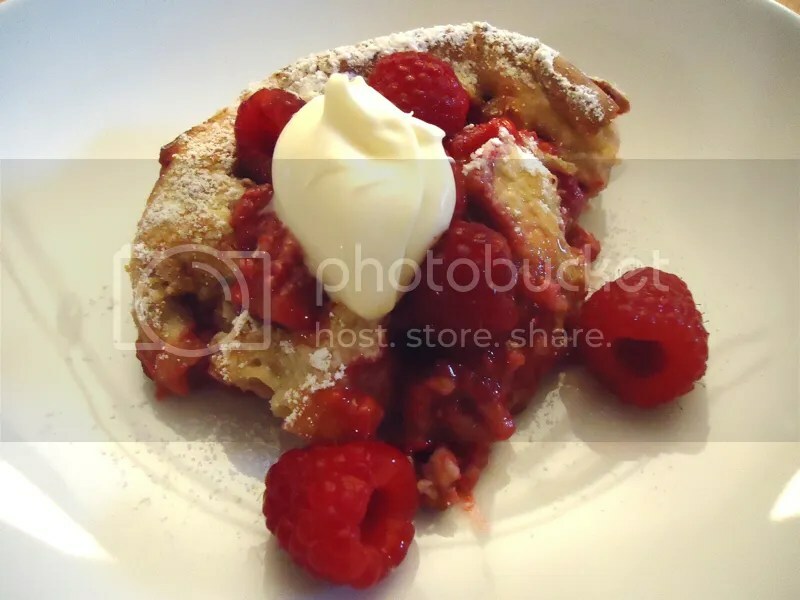 Bake 17-18 minutes more, then serve as described for the berry version. My mom would make us dutch babies with sliced lemons and powdered sugar on Sunday mornings (family tradition). But this take on them looks exceedingly scrumptious! I’ve been pestering Landon for a taste…. I REALLY hope I can get Teressa to make this recipe. Best wishes and huggles to the family!